Sampaio Basquete (LBF) added to their roster 29-year old Chilean international center Ziomara Morrison (194-89, agency: ProDep Management). She started the season at Tosyali Toyo Osmaniye in Turkish TKBL. In three games she recorded 15.0ppg, 8.3rpg, 2.0apg and 2.0spg this season. The last season Morrison played at Wisla Krakow in Polish BLK. The team played in three different competitions (!!!) that year, and she was exposed to basketball on different levels. In 34 games she averaged 8.7ppg, 5.1rpg and 1.2apg. Morrison helped them to win the cup and make to league final. Good season as she was named League Player of the Week. She also played 12 games in Euroleague where she had 12.3ppg, 6.4rpg and 1.5apg. 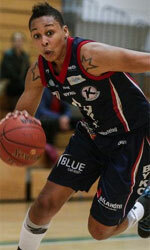 Morrison also played 2 games in Eurocup where she got 14.0ppg, 3.0rpg, 2.0apg and 1.0spg. The list of the past achievements is quite long as among others Morrison won Chilean Liga Femenina championship title in 2014. She was also voted Eurobasket.com All-Turkish TKBL 1st Team in 2016. Morrison represented Chile at the ODESUR Games in Santiago (Chile) four years ago. Her team won Silver and her stats at that event were 5 games: Score-1 (28.6ppg), Reb-1 (19.8rpg), 2.6apg, 1.0spg, Blocks-1 (2.4bpg), FGP: 56.3%, FT: 83.5%. Morrison is quite experienced player. Thanks to her pro career she managed to play on three different continents (Europe, Latin America and of course North America) in five different countries. Morrison has played previously professionally in Italy (Ribera), Spain (Rivas Promete), WNBA (Indiana Fever and San Antonio Silver Stars) and Chile (Los Leones and Univ. Austral).